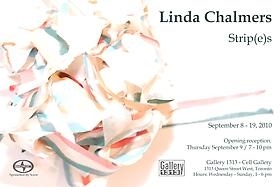 WE ARE PLEASED TO ANNOUNCE LINDA CHALMERS IS THE RECIPIENT OF THE 2010 SCION SESSION ART GRANT. THE TORONTO ARTIST, WHO RECENTLY JOINED THE PATRICK MIKHAIL GALLERY ROSTER OF ARTISTS, IS A GRADUATE OF THE ONTARIO COLLEGE OF ART AND DESIGN. AS PART OF THE SCION AWARD, SHE WILL LAUNCH A NEW BODY OF WORK ENTITLED "STRIPES" AT TORONTO'S GALLERY 1313. SHE NEXT APPEARS IN "THE TRIUMPH OF THE THERAPEUTIC" AT PATRICK MIKHAIL GALLERY FROM SEPTEMBER 22 TO OCTOBER 25, 2010. Inspired by the concept of artist detritus, Linda Chalmers explores the discarded materials she uses in her art practice as artwork in and of themselves. Known predominantly as a painter, Linda utilizes rolls and rolls of tape of varying sizes in order to create the hard-edge lines that are prevalent in her paintings. The used and discarded strips of tape are coloured by paint that has bled over the exposed surface, resulting in striped lengths of tape of varying hues. Scrunched up in balls of tape out of convenience, Linda discovered the delicate beauty inherent in these hollowed orbs of coloured, imperfect stripes. The strips of stripes, once simply part of the artist's detritus, become independent of its role in painting; the process of painting becomes the product, documented through digital photography.